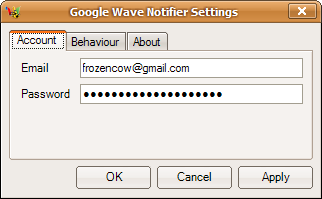 v1.4.1 (msi) (1 MB)Notifies using Growl for Windows for unread waves in Google Wave. Polls Google Wave for unread waves. 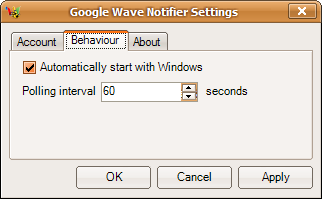 Notifies unread waves using Growl for Windows (or Windows balloons). Shows number of unread waves in system tray. Interface mostly based upon Gmail Growl. Finds all installed browsers (not only predefined ones). Fixed predefined browsers not being detected on some systems. Improved password encryption (thanks to Brian Garner). Added ability to use user-defined browser (thanks to Brian Garner). Added ability to click balloon-tips. Fixed double balloon-tips showing when not using Growl. Added fixed Growl assemblies (which fixes Windows Vista/7 problems).